Starting new ways to increase blogging income is hard. Like… really hard. It can be really tough to get out of your comfort zone or set schedule. It can be easy to get stuck in a rhythm and a certain way of doing things. It feels comfortable. But when you push yourself to do new things, it can reap the best rewards. So here’s a quick trick for increasing your income; it’s something I learned to do as a blogger and I quickly saw my earnings rise. So many of you have already heard of affiliate income, but don’t worry, I’m going to show you a simple way to apply it to your blog so you can increase your monthly earnings. As for those who don’t know what affiliate income is, I’ll explain. When you promote another person’s product through your own special tracking link, and someone clicks through and buys the product (and only when they buy it), you’ll receive a commission at no extra cost to them. It’s a great way to make money without making your own product. You just have to make sure that these are things you’ve used yourself and love. If you don’t do this, you’ll erode your credibility if someone buys a product you recommend and it turns out to be a bad experience. So here’s how you can apply this. 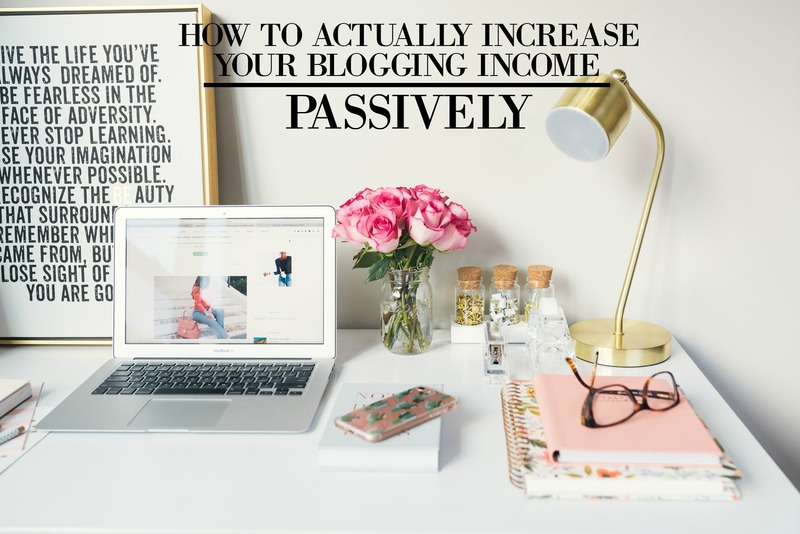 Go through some of the top bloggers you follow/admire and look into their income reports or posts that talk about how they earn their income (a good example would be Michelle from Making Sense of Cents). Quick Note: An income report is a place where a blogger talks about how much they made in a month, their expenses, where their income came from, and how you can do the same thing too. It’s super helpful! Look through the list of affiliates they promote. Some may promote over 30 products and that’s just fine. Look at their top performers and write them down. Usually their top performers are ones that have a good payout for every sale you make or they’re recurring monthly payments (meaning you don’t just get paid once when you make a sale. It happens every month.). Look into their affiliate programs and see what their payouts are. If this is something you feel that you can promote and sell, then sign up. Once you’ve been accepted, find a day in the week to put the affiliate links into your posts and write content on the product. So for example, I had been using Convertkit for awhile, but had never signed up for their affiliate program. Once I was accepted, I started to go back on my past income reports and posts on blogging. Then I created sections in the post (if it applied) to talk about Convertkit and its benefits. Then I placed the affiliate links into the post and updated the content. It was a simple task that only took me a couple hours. Feel free to check out my post on how to start an email list! It’s super important for having a successful blog! For the most part, you only have to spend a few hours promoting and inserting affiliate links, and then… it’s passive! Once those links are in place, there’s nothing more you need to do with them. People will click through, make a purchase, and you’ll get a commission. Of course in the future you may want to promote special sales your affiliates are having, but the initial time you needed to spend on it is done. This is honestly one of the easiest ways to increase your earnings! You don’t need to create your own product (although it’s definitely something you should do in the future), someone’s already done that. You just need to promote it and you’re good!